The Travel Wallet have sponsored Mervyn Smith ( known to us as Merve The Swerve )as a friend and valued client . After overcoming major life saving heart surgery in 2016 it is time to give back the time graciously extended to me . 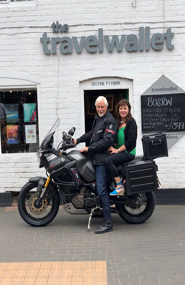 I am doing a solo motorcycle round trip of some 5000 miles from my Shropshire home to the very tip of Norway, way beyond the Arctic Circle , for Open Doors UK. They raise the awareness of the plight of persecuted Christians in countries where worship freely is impossible and where dying for you faith could be a daily reality. I am riding for those who have no voice . I will be paying for all of my travel and trip costs so whatever money is raised will go directly to Open Doors UK. Would you please consider supporting my challenge ?